Footage of EFF members illegally removing ANC posters could see the party sanctioned by the IEC. 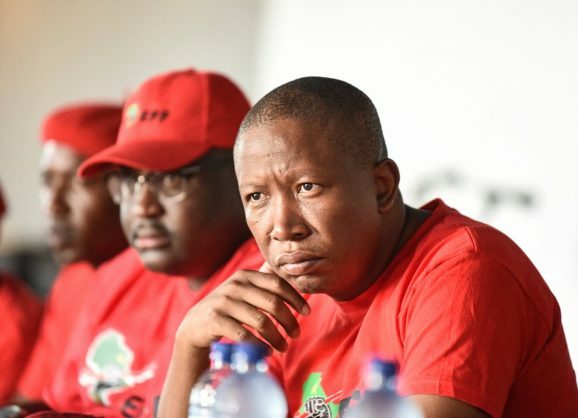 Responding to a video showing EFF members tearing ANC posters off a wall, EFF leader Julius Malema responded to ANC head of elections Fikile Mbalula with an apology and called it unacceptable and “the highest form of stupidity”. He undertook that the EFF would personally ensure the ANC’s posters were put back. Earlier, news broke that the EFF said they had seen and taken note of footage of their members engaging in the illegal removal of rival ANC posters. The statement came, ironically, on the same day the party signed an electoral conduct pledge undertaking to not do precisely this sort of thing. The footage had emerged just hours earlier and, in it, EFF and ANC members can be seen confronting each other. According to those claiming to have information about the incident, however, ANC members allegedly also tried to remove EFF posters, or were supposedly “provoking” EFF members by placing ANC posters next to theirs at the Mpumalanga, GwaQuka, township venue where the EFF will hold a manifesto rally this weekend in Emalahleni. A party that breaches the electoral code, as the EFF has done, can be fined up to R200,000, lose electoral deposits, be made to stop working in an area or even lose its votes from a certain area. In the worst-case scenario, they could be barred from contesting elections at all.